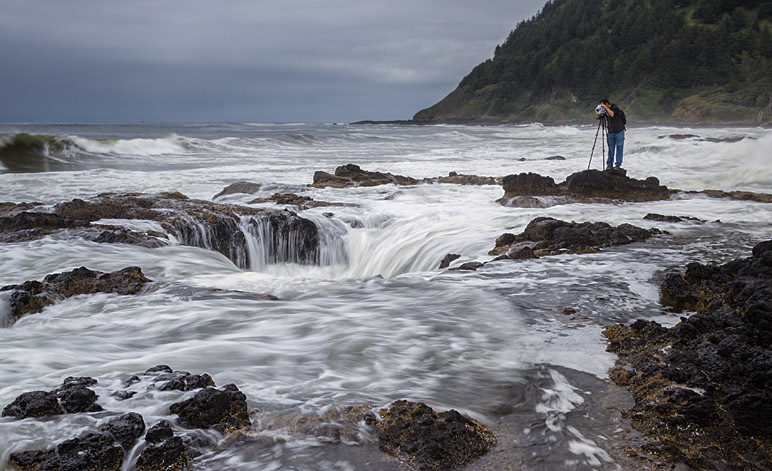 Thor’s Well is a spectacular coastal blowhole sometimes referred to as a natural salt water fountain. It is one of several remarkable geological features that can be found at Cape Perpetua which is around 2 miles (3.2 km) south of Yachats in Oregon State, USA. Cape Perpetua is a characteristic Pacific Northwest headland and at its highest point climbs to over 800 feet (240 m). In 1908 the region was absorbed into the Siuslaw National Forest. Thor’s Well is best seen around high tide when wave surges force water through the lower chamber and up through sinkhole creating a twenty foot fountain that crashes down onto the surrounding plateau of rocks. Waves simultaneously pour over the nearby rocky lip and sweep across the jagged rocks of Cook’s Chasm. As the waves retreat, the water cascades down into the seemingly never ending sinkhole with beautiful but deadly force. Thor’s well is naturally not bottomless and simply connects to the ocean through an underground chamber creating the illusion that it’s behaving like the bath hole of the God’s. This has led to it being nicknamed the drainpipe of the Pacific. It’s popular with nature photographers but the risk of being either swept into the well or out across the jagged rocks should never be underestimated. Cape Perpetua is less visited than other beauty spots and on occasions can seem deserted. Thor’s Well can be accessed from the north side of Cook’s Chasm and is 145 metres Northwest of Cook’s Chasm Bridge on Route 101 – Oregon Coastal Highway. 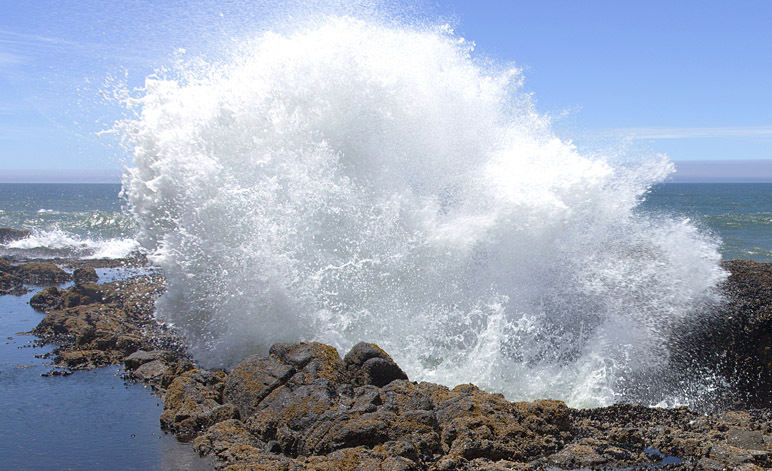 Other nearby coastal features include Spouting Horn blowhole, The Devil’s Churn and Cape Perpetua Beach.